I got involved in natural foods back in the 1970s. I studied macrobiotic food cooking and was interested to study medicinal foods and get more health conscious. I worked at many restaurants and had many food-related jobs. I worked production jobs, factories and an ice tea company back when there were union jobs that paid well with benefits and had on-site training for different positions that you were learning. I worked at Italian restaurants, like the old San Remo in Northeast Philly, when every kid in the neighborhood wanted to do dishes and bus help to make some money. I’ve worked in places where you were actually working with a chef on the line and not someone with no formal training, giving orders they themselves knew nothing about. There were a few Chinese restaurants back then in Northeast Philly, and I was fortunate to learn how to make some real Asian dishes, although they weren’t all Vegan or vegetarian. When I left Philly to move to Florida in 1979, I worked in Asian, Italian and formal seafood restaurants. I began making seitan around then, too. Going back to my great aunt’s house and making real pumpkin and berry pies. I get my inspiration from younger folk showing off their creations and artistic skills. Also from the feeling of natural organic foods and prep and the positive energy I feel when I eat a certain craved food. I was always more on the salty and sour taste of foods. Sauerkraut dishes and pickled and fermented foods. Sour foods take me back to Thanksgiving, and then things changed in my body chemistry and I was craving high-energy foods. Baked pies and stews were faves. I can remember, back in fifth and sixth grades, craving shepherd’s pie and stewed tomatoes and fruits. Then many years later, duplicating these dishes with seitan and seitan stock gravy. I wouldn’t say I was picky. I just needed to be introduced to real foods and now real beer, etc. I come from a poor growing up background, and a lot of foods you wanted were not at your disposal. I’ve studied and learned and know what my body and energy level calls for. I was never big on candy and foods that were forced on me, and that’s why kids act they way they do from the effects of those — I call them — false foods. The additive and chemicals, coloring, etc., play a central role in the way the body reacts to those ingredients. I would never eat waste product foods now, as I do not get the energy I need from them, and I know better now and teach others the same. Once I got the energy from whole grains and organic veggies and fruits and nuts, there was no going back. Every condition I had seemed to go away and not return. Growing up, what was your favorite meal/food/snack to eat outside? Did you enjoy eating outside anywhere in particular? How about now as an adult? I always liked Asian foods and culture. Bruce Lee was a kid favorite and The Green Hornet. I would get takeout from local Chinese places and find a quiet place to eat and enjoy my surroundings. Just sitting in a park in a field or somewhere was just relaxing. I recently ate at an outdoor place I used to visit many years ago. I would park and eat in the car, listening to a favorite band. What do you think of the vegetarian/vegan world today? 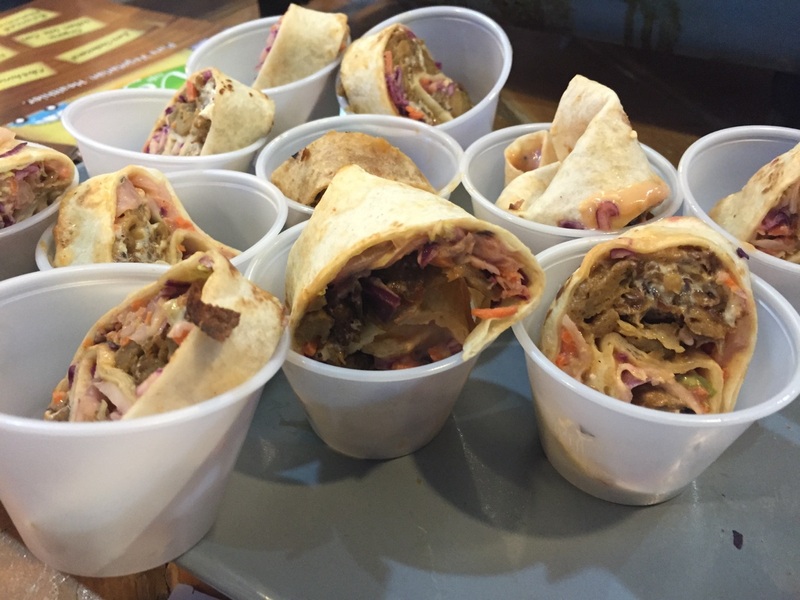 The vegetarian and vegan scene is just the same. It’s just that now more people are eating this way, talking more about the movement. I’m up against a lot of generic versions of the food I make, but I encourage competition, as I’m always looking for real competition. There’s not much out there really. Not in this area anyway. It takes a long time to get a name for yourself and just to get established. I’m talking about stage one in the preparation of making a real product from scratch and then making dishes from that. There are some amazing vegan chefs out there with real creation, not just making seitan pizza or seitan cheesesteaks. 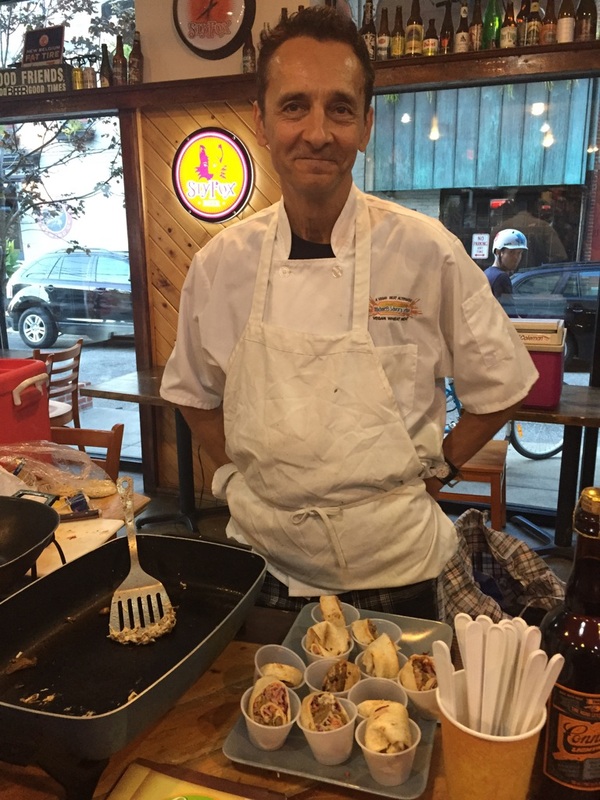 Whole Foods is a place I sell to, and they have some great chefs there doing some really good dishes. They just do not get the recognition, as it is a corporation and they just do not focus on a particular person cooking. It’s kind of like a great band but no one knows the lead singer’s name. It takes a long time to get a hot song out sometimes, like a great chef at a restaurant to be taken serious as a local or traveling talent. What do you think of the modern food world (franchise chains, Whole Foods/Trader Joe’s, from the Food Network to Groupon, from Yelp to foodie bloggers)? The chains are there for a profit. Most of them are not involved in for your healthy or concerns. The choice is nice, but again this is your decision to choose and learn what is best for you. I think one of the biggest obstacles is being outsourced by foreign competition and not being able to even service your local community. A lot of businesses can’t get off the ground because of all the anguish you have to go through for very little profit. Everyone needs support, encouragement and a chance to be heard to get their food, message, song, idea out. It’s always great to have help. Bloggers, public relation, any kind of signage. I can’t emphasize the importance of having a sign in a place of business clearly advertising for you and the important of you and your buyer working together to sell a product. What seitan recipes do you want to share with us? As far as recipes, I put a lot of time into my website (MichaelsSeitan.com, where you’ll find a lot of vegan recipes) for everyone to enjoy. 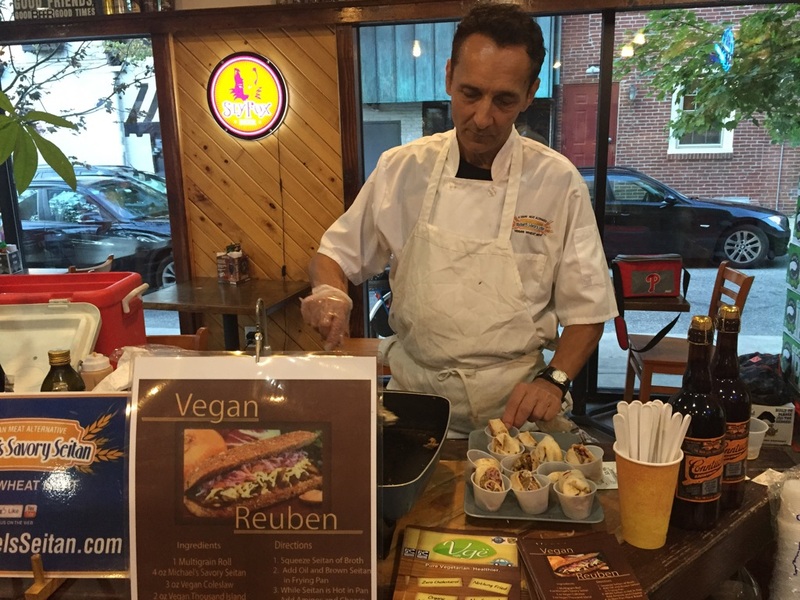 I favor my Seitan Cheesesteak, which I believe has a taste like no other, and the Seitan Rueben is another classic. Enjoy both and all the other recipes I’ve posted on my site! Hats off to all the vegan chefs who are truly into doing what they love. Not everyone out there is about getting rich and competing with who is the best one, etc. Food to me is the highest art form in the world. It can change so many things. A mother or a girlfriend can control her whole family’s feelings by the food she creates. Enjoy every precious moment — live life to the fullest and enjoy creations. Support vegan, local and learn where your food source comes from. 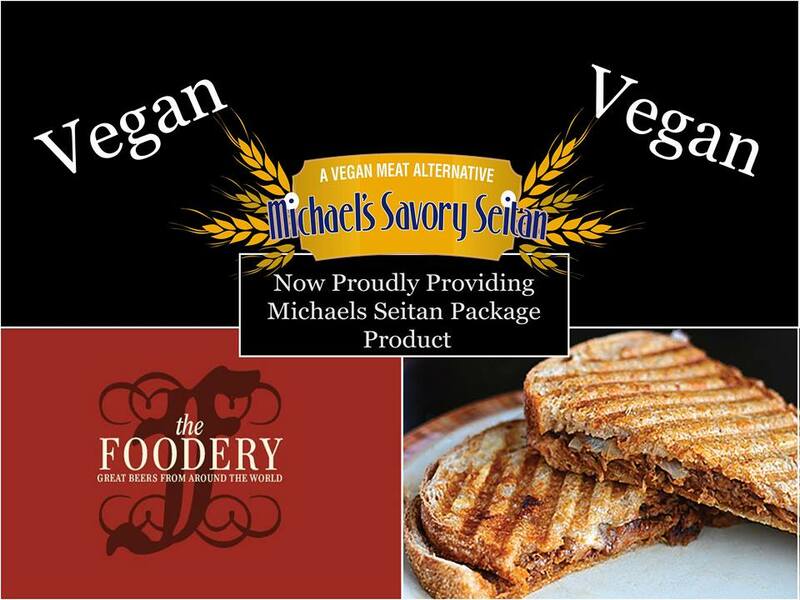 You can find Michael’s Savory Seitan at such restaurants/markets as Adobe Cafe, Dawson Street Pub, The Foodery, Vge Cafe, Whole Foods and many more, which you can locate here. 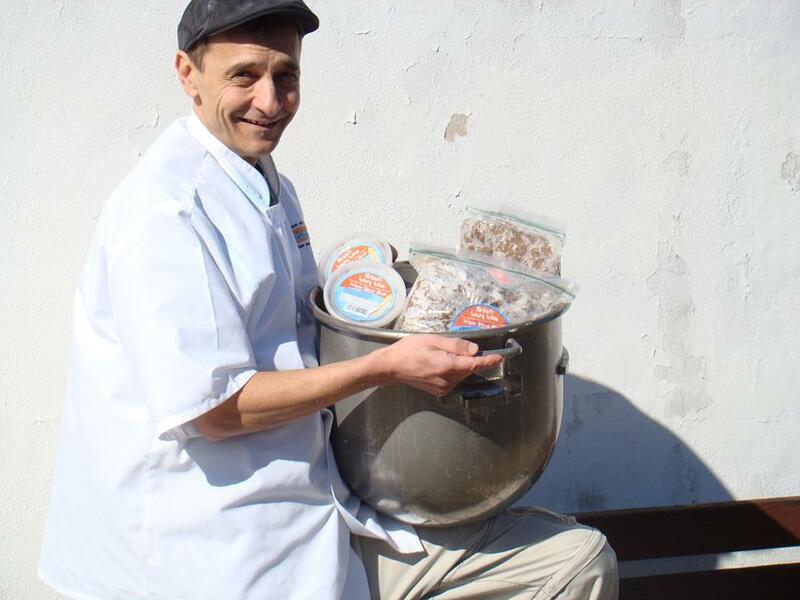 For more on Michael Casady and Michael’s Savory Seitan, visit MichaelsSeitan.com, and follow Michael’s Savory Seitan on Facebook and Twitter.